It’s a troubling scenario. An elementary school student is wrestling with problems at home. Schoolwork is a challenge. Peer pressure has become suffocating. Classes get skipped. Dropping out becomes an option. The student needs mental health support, but no one seems to recognize it. That issue was the focus of a Wright State research project designed to identify and eliminate gaps and barriers that block the flow into the mental health system of students and others in need. Former Wright State social work student Rebecca Holtkamp helped with the research in 2011 as part of the university’s undergraduate summer research program headed by Dominique Belanger, Ph.D., director of undergraduate research and STEM activities. Today, Holtkamp is working on her master’s degree in social work at The Ohio State University and applying her undergraduate research experience at Wright State. Wright State’s Summer Undergraduate Research/Scholarship/Creative Abilities Program enables students of all majors—from engineering and psychology to marketing, history and art—to conduct research as part of their undergraduate experience. In addition to conducting research, the students meet for brown-bag lunches, present their research topics to each other and are addressed by professional researchers. 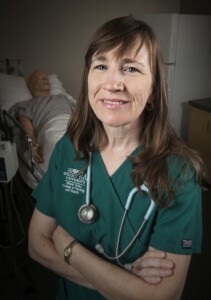 Karen Herzing, an undergraduate nursing student, used the program in 2012 to conduct research about the impact on parents of having a baby in a hospital neonatal intensive care unit. Herzing’s research took her to Dayton Children’s Medical Center’s neonatal ICU, where most of the babies were premature or compromised in some way. She interviewed 10 families over the summer of 2012. What she found were families living on the edge—traumatized by having to see their babies clinging to life, having to leave them to go home, and then having to handle nerve-rattling telephone calls from the hospital. One implication, or suggestion, was that parents who have been through the experience be made available at the hospital to the parents trying to cope with it. Another was to have neonatal nurses specifically visit the homes of parents to help them care for their infants after they are released from the hospital. Herzing said it would also be helpful to have a neonatal nurse out in the community to educate parents-to-be on ways to reduce the chances of having a premature baby. For Holtkamp, she sought out the undergraduate research program because research is such a big part of the social work profession. She first became interested in social work after her parents got involved in foster care, raising foster children along with Holtkamp and her three siblings. Her interest further intensified during her volunteer work while she was a student at Xenia Christian High School. Holtkamp’s research at Wright State was part of an “Integrating Schools with Mental Health Systems” grant that reviewed the effectiveness of links and referrals in Greene County between mental health agencies, schools, community health programs and juvenile detention centers. She recorded and transcribed interviews, coded and categorized the data and wrote up a summary. She also used quantitative data from a juvenile court survey of court workers on how to make mental health referrals. In addition, Holtkamp sat in on a focus group, which included two men caring for their grandchildren who were using mental health agencies. “That offered insight into their experiences, where the gaps had been,” Holtkamp said. Although the men had generally good experiences with the connections between schools and agencies, they said there were a few weaknesses in the system. For example, some teachers were unprepared to deal with the anger and aggression of students, there were a lack of referrals of students in a certain grade and referral policies varied from school to school. Holtkamp said the research underscored the importance of linkages between schools and agencies and the need to strengthen them. Not doing so can lead to students giving up on themselves, skipping school or getting held back. “That can lead to a lot of long-term issues, not only for the student and their family, but also for the larger community in that they’re not getting an education,” she said. Holtkamp presented the results of the research at the National Association of Social Work Conference at Ohio State last year. She believes the research experience was a factor in her getting accepted in the master’s program at Ohio State. As part of the Ohio State program, Holtkamp is working at Hannah J Ashton Middle School in Reynoldsburg, Ohio, to get her specialization in school social work. She did a gap analysis and needs assessment for the school, which teaches many economically disadvantaged students.